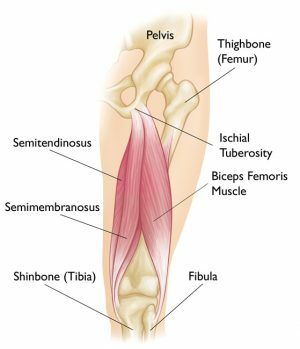 Hamstring Injuries – what does the latest evidence show. In this blog, I will focus on a recent research article that looks at hamstring injuries. The systematic review looks at treatment and rehabilitation following hamstring strains. Hamstring injuries are very common on the sporting population. In sports such as rugby and football 12-16% of all injuries are to the hamstring. A quick and safe return to sports are important and we will look at the most evidenced ways to achieve this. The study shows that eccentric hamstring exercises, progressive running and a trunk stability/agility programme enabled athletes to return to play quicker. 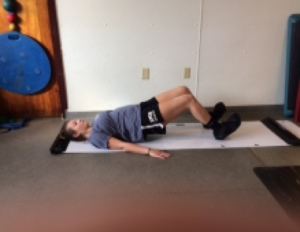 There are lots of different eccentric hamstring exercises out there. This study uses supine heel slides. In this exercise, a bridge is performed and the knees are slowly straightened, then returning to a bent position. The further the knees are straightened, the harder the exercise. The exercise can be further progressed by doing on one leg as pain allows. 15 repetitions daily should be performed. You could also do eccentric hamstring curls on a gym ball. Other eccentric exercises for the hamstrings include dead lifts (single leg and 2 legged) and Nordic hamstring curls. The running drills that are most effective involve an acceleration phase, a maximal sprint phase and a deceleration phase. The maximal sprint is gradually increased as pain allows. Each running session consists of 18 runs with a gradually decreasing acceleration and deceleration distance. The maximal sprint distance is kept to 20 metres. This programme includes many different exercises. The agility exercises include short distance shuttle runs, side to side shuttle runs and fast feet work. The intensity at which the exercises are done is gradually increased as pain allows. 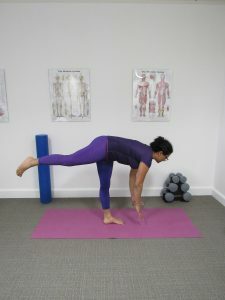 The trunk stabilisation programme includes exercises such as bridging, prone and side planks and single leg balance. The difficulty of these exercises gradually increases. As always, if you have any questions on any of this information, do not hesitate to get in touch with us at appointments@westpointpractice.co.uk or call 0113 244 0115. What causes my knees to crack? Where knees are concerned, this must be the most popular question that I get asked. So in this blog I am going to explain what these sounds are and why we should not be overly concerned. Firstly, one of the most important things to get across is that there is no research that shows a link between joint clicking/cracking and joint pathology (injury). A study found that 99% of those with clicky knees were pain free. If however you do experience pain when your knee clicks, I would recommend either coming in to see us or visit your GP. It is thought that there are 4 causes of the clicking/cracking. Firstly, it can come from sources outside of the knee joint and be caused by tendons snapping over bony prominences. The most common around the knee is the iliotibial band (ITB) which crosses the outside of the knee joint. On bending and straightening the knee this band flicks across the bony outside of your knee causing a clicking/snapping sound. Secondly, it can be caused by gas bubbles within the knee joint popping. When the bones around the knee move, they can create a vacuum within the joint. This then leads to the gas bubbles collapsing and causing the common popping sound. Thirdly the slip/stick phenomenon as the knee cap moves over the bottom of the thigh bone creating a clunky feeling/noise. As the knee bends and straightens, the knee cap glides and slides in a groove. These movements can sometimes be quite jerky and slip/stick through the movement. This causes vibratory signals which give cause for the clunking noise. These vibrations actually reduce in osteoarthritis of the knee joint. It is thought to be due to reduced range of movement and reduced lubrication as we age. Lastly is the fine grating that can occur in knees – especially noticeable on going up and down stairs. This is thought to be caused by fluid passing between the roughened surfaces of the back of the knee cap and the thigh bone. This roughening of the cartilage surfaces of the bones is perfectly normal. So in conclusion, knees do snap, crackle and pop and this is perfectly normal. The only time to be concerned is if this is associated with pain. That is when I would recommend coming to see either ourselves or your GP. If you have any questions about this or anything else, don’t hesitate to get in touch by email on appointments@westpointpractice.co.uk or call us on 0113 244 0115. In this blog I am going to take a look at heel pain (plantar fasciitis). This condition is common in runners. It is also something that I have recently recovered from, so hopefully I can provide some useful advice from my own experience. 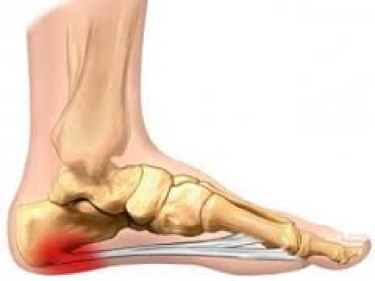 The main symptom of plantar fasciitis is pain in the heel region, near to the insertion of the plantar fascia. In my experience the condition is commonest in runners and in people who stand for long periods in their job. A high body mass index is also a common risk factor. In my case it was caused by standing for longer periods at work in shoes without good cushioning. Pain is normally worse 1st thing in the morning, the first few steps can feel like walking on glass! It can also be painful when walking after a period of prolonged sitting. It normally gets easier the more you walk but will normally be worse if you walk too far or spend too long standing. There are a number of treatment options available for plantar fasciitis. In my experience a combination of treatments works best. One of the things that I found helpful initially was to wear supportive shoes with good heel cushioning. Running trainers are ideal. You could also try buying gel heel cushions. They can help improve comfort when standing or walking by improving shock absorbency. If your job involves standing for long periods, I would recommend speaking with your employers to see if you can reduce the amount of time spent standing as this can often help symptoms to settle down. For those of you that are runners who suffer from heel pain, you may have to reduce the distances you run. If you feel significantly worse after running, you may need to stop running for a short period to allow your symptoms to settle. What often happens is the pain will be present at the start of the run then ease off and get worse towards the end of the run. The pain will normally be worse the further you run, therefore, reducing the distances that you run can be helpful. To maintain fitness levels, cycling or cross-trainer in the gym are great as these involve less impact forces. It can also be a good time to work on improving lower limb strength with some simple home exercises like squats, lunges and single leg dips. Other treatments that are shown to help are regular plantar fascia and calf stretches and strengthening exercises. 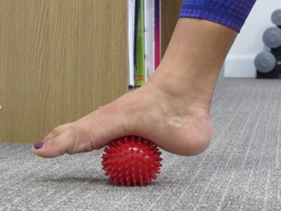 Self-massage with something like a golf ball or rolling pin to the medial arch of the foot can help. The heel raise is performed on a floor or a step with the toes extended on a rolled-up towel. The exercise should be uncomfortable but not painful, we would normally say a maximum pain of 4 out of 10. I would advise 3 sets of 10 repetitions. If at first you are unable to do the exercise 1 legged, do 2 legged and gradually try to increase the load to 1 legged. If you are able to do this without fatigue when doing 10 repetitions, add weight to the exercise – using a ruck sack with books or tins of food in is ideal. Soft tissue massage with ball or bottle – 5 minutes once every day. Heat Treatment for pain relief – yes or no???? We are often asked for advice on heat therapy vs. cold therapy for pain relief. In this blog I will be looking at the use of heat and the evidence behind it. The theory behind using heat is that it increases blood flow and therefore the supply of oxygen and nutrients to a specific area. It is also thought to reduce muscle spasm, improve mobility and reduce pain. So the big question is, does it work?? When we look at the scientific research, there is little evidence that heat alone provides significant reduction in pain. A systematic review of research in 2006 looked at the efficacy of superficial heat in the treatment of low back pain. It found there was moderate evidence in some trials that heat therapy provided some reduction in pain and disability in people suffering with acute low back pain. However, the relief was only shown to occur for a short time and any reduction in pain levels was relatively small. Further pain reduction was achieved when heat therapy was used in conjunction with gentle exercise. So, in light of this, you’d probably expect us to advise our clients not to use heat for pain relief. Not quite! A lot of our clients tell us heat is the main thing that actually helps with their pain. This can be both in the short term and the long term. So we would advise clients to give it a go. It works for some, not for others. The most important thing is to apply heat safely e.g. a hot water bottle wrapped in a towel to avoid burning the skin. You should also keep checking your skin for signs of irritation from the heat and stop if you need to. Also avoid using heat in areas of swelling or numbness. We would also recommend exercise as part of your treatment plan. It plays a key part in the reduction of pain and restoration of function. If you are unsure, just ask and your friendly physio will be more than happy to advise you! We are happy to be able to offer 25% off all running gait analysis appointments throughout March 2017. The appointments usually cost £50 for a 1 hour assessment. This is a saving of £12.50 on the usual cost, meaning you only pay £37.50. The assessment includes video analysis of your running gait as well as a comprehensive lower limb assessment. This will involve looking at your flexibility and strength to try and identify any areas that need working on. This is ideal for anyone looking to improve your running times, if you are struggling with an injury or if you are completely new to running and wanting to make sure you can start and increase your running safely. For more information, visit the gait analysis page by clicking here. What to do with acute ankle sprains? This is a very common injury that we see in clinic and is usually due to rolling outwards or inwards on your ankle. Aside from pain there may be swelling and bruising around the ankle and foot. A common question that clients ask is what they should be doing in the first few days following an ankle sprain. Taking the right steps in the few days and weeks following such an injury can make a large difference to recovery time. Do you need an Xray? There are a few rules to follow when considering whether you need further investigation or imaging. If you have severe pain and are unable to weight bear or are struggling to take a few steps, especially with a forceful injury, we would recommend seeking medical advice sooner rather than later. The medical professional you see will use guidelines such as the Ottowa rules to determine whether further imaging is indicated. Using an ice pack or cold pack in the week or two after injury has proven useful for pain relief, reduction of swelling and improved function. You should only use this method if you haven’t lost the feeling in your skin and always make sure you wrap the cold compress in a towel to protect your skin. You can use a compress for upto 20 minutes every 2 hours. Do check your skin regularly during this period to make sure you don’t burn. Compression of the area from your foot to knee is a useful strategy to reduce swelling in the first two weeks after injury and improve overall recovery time. A stirrup brace or lace support are more effective than a tubular compression bandage. You can also combine these by wearing a tubular support under a stirrup brace to enhance the effect. Remember to keep your toes visible to make sure you are able to see that your toes don’t lose blood flow as this means your compression is too tight! Keep yourself moving within reason! Early mobilization with you putting weight through your foot and ankle within your own pain threshold is much better than rest for better recovery time and return to full function or sport. Keeping moving, within reason, can also help reduce swelling and improve circulation which will help provide the area with the nutrients it needs for recovery. Try gentle range of movement exercises in the first week following injury, e.g. ankle circles or ankle pumps. As your pain improves, gradually increase activity and exercise. Seek advice from your friendly physiotherapist if you need further assistance with treatment or rehabilitation! Some people find that basic pain relieving and/or anti-inflammatory medication helps manage their symptoms while they recover. Your pharmacist at your local chemist is a great point of initial contact if you are unsure what would be useful for you and what you may or may not be able to safely take with any other medication you may be on. Depending on the severity of the injury, recovery can take anything from 2 weeks to several months. The first week following ankle sprain should mainly concentrate on swelling and pain control and getting the ankle moving gently. A physiotherapist will be able to help with treatment to help restore strength, movement and control with the aim of getting you back function and sport and most importantly, to reduce the risk of reoccurence.